A site adjacent to The Summit shopping center could soon be the location of a hybrid housing project. 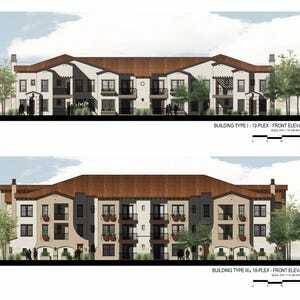 Plans are underway — pending state approval in January — for a new apartment complex featuring regular and workforce housing at former Summit Sierra land on Mount Rose Highway and Interstate 580. The "Summit Club" project will feature 584 one- and two-bedroom apartment units, 117 of which will be allocated as workforce housing for tenants who make 50 percent or less of the median income in Reno. The median household income in the area is $44,426 according to the Center for regional Studies at the University of Nevada, Reno. Per capita or individual income is at $25,663. Housing distribution for the Summit Club uses what's known as an 80/20 concept seen in many large metro areas where 20 percent of a property is set aside as affordable housing while the rest is reserved for regular tenants. The project is currently seeking approval as part of a bond financing program from the state that uses federal funding. Chip Bowlby, one of the managing partners for developer Sierra Summit LLC, says this will be the first project of its kind in the state to use the bond financing program on a "Class A" location, which refers to attractive areas that are typically new, have low vacancy and have higher income residents. The Nevada Housing Division could not verify if this is the first project of its kind to use the bond financing program, only confirming that it would be the first such project in two decades for Nevada. "We're going to show that we can take a Class A location like this and make it available for workforce housing for the city of Reno and surrounding areas," Bowlby said. "We think it's great and will hopefully be the first of many (similar projects)." For some, however, workforce housing is seen as a less loaded term for affordable housing. The switch to using workforce housing is a conscious one, according to proponents. The phrase affordable housing typically carries a stigma with it, especially among some property owners who equate low-income housing to lower property values and even a higher incidence of crime. For supporters of the project, however, the 80/20 concept is a way to address most of the key issues with affordable housing while filling a large need in the community. "We're kind of in a rental crisis right now in Washoe County where there are effectively zero units available that's affordable to seniors and some families as well so we're very excited for this supply to come into the market," said CJ Manthe, Nevada Housing Division administrator. "It's very much needed." Back during the heady days of the boom, The Summit, then known as Summit Sierra had bigger plans. This included setting aside more than 26 acres of adjacent land for the mall's second phase. The recession, however, changed all of that and The Summit decided to focus its efforts on the existing developed property. Eventually, ownership of the land reverted back to Wells Fargo, which started entertaining offers for the property. By October 2014, Sierra Summit, LLC, entered negotiations with the bank and was one of nine to 12 groups bidding for the property, Bowlby said. One year later, Sierra Summit, LLC, closed on the property for $9 million. Sierra Summit, LLC, has no affiliation with The Summit shopping center ownership. Bowlby cited location and access as key reasons to why the land was attractive to him and his partners. It is part of the Redfield Regional Center Plan, which identified it as the southern portion of the South Virginia Street Transit Oriented Development (TOD) Corridor. It is also adjacent to an RTC Park & Ride location, which is especially integral to the developer's plans for workforce housing. "This is one of the stops of the transit service that connects with downtown Reno and also goes down to Carson," Bowlby said. "Even Incline Village is accessible right here from Mount Rose Highway so workers (who can't afford to live there) can come over the mountain and have an affordable apartment." The Summit had positive things to say about the Summit Club apartments. David Silverstein, a principal with The Summit owner Bayer Properties, says he's been apprised of the project by Bowlby and liked what he saw. "It certainly appears that he is doing to be doing a very nice project there," Silverstein said. "We welcome having more people living around … the Summit Sierra and I think it will be a nice addition to that southern part of Reno." With the economy improving and projects such as Tesla's Gigafactory and Switch's SuperNAP expected to drive more interest and employment activity in the area, being able to fill housing demand at all socioeconomic levels is important, said Bruce Breslow, director of the Nevada Department of Business and Industry. The state, for example, is already planning to set aside resources for a separate project that will have 100 percent of its units allocated to affordable housing as a way to address some of the employment activity generated at the Tahoe Reno Industrial Center. "We're going to get a lot of jobs in the next five to 10 years and not all of them will pay $100,000 a year," Breslow said. "Even for Lake Tahoe, it's hard to find a place to live for a lot of people … so we're certainly going to need a lot of workforce housing in Northern Nevada." Even as the Northern Nevada economy continues to diversify, the service and retail industry continues to account for a large chunk of the area's economy, according to Manthe. Many workers of modest means include mall employees and students working their way through college as well as families who need just a little breathing room and some stability in order to work their way into better paying jobs and, eventually, a higher income bracket. "The folks of modest means who will be living in these units, those are individuals in our communities who may have service jobs of lower wages but they're still contributing members of the community," Manthe said. "We need to have everybody doing the different jobs in the community to have a place to live." One advantage of doing an 80/20 tenant mix as opposed to going 100 percent regular or affordable housing is that you get a greater mix of residents, according to Manthe. For the Summit Club project, all housing units will look similar regardless of whether they are regular or workforce housing, with residents spread around to prevent any stigma or segregation. Rent for workforce housing is expected to be $595 for a one-bedroom apartment and $715 for a two-bedroom unit. Regular renters will pay about double those amounts. The U.S. Department of Housing and Urban Development is a big proponent of 80/20 projects, Manthe said. "HUD came out with a directive that they don't want everybody of lower income being concentrated in one neighborhood," Manthe said. "They want them to be more dispersed so (you end up with a mix that's) a lot more economically diversified." The 80/20 mix is also one of the requirements of the bond financing that the project applied for from the state. The state says that money for the bond comes from federal funding that would either expire or roll over to the next year if not used. Neither the taxpayer nor the state assumes any risk from the bond, said Michael Holliday, chief financial officer of the Nevada Housing Division. "(The developer receives) a competitive interest rate as well as tax credits and some cash equity for the project," Holliday said. "We just serve as a conduit … so we're passing the liability to the developer, who bears the risk." A final decision on the program will be made in January by the Board of Finance, which includes Gov. Brian Sandoval, the state treasurer and controller, and two citizen members. Sierra Summit will be required to do their due diligence with issues such as zoning and environmental testing as well as providing market studies and proof of cash flow. If approved, the state also will monitor the property for at least 15 years to ensure they meet all requirements. Construction can start as early as April with the first renters able to occupy a space by late 2016 or early 2017, Bowlby said. Total cost of the project will be about $100 million. Manthe says it is highly likely Sierra Summit, LLC, will get approval, especially given its track record. One reason the housing division supports Sierra Summit, LLC, is because its members have experience working on similar projects in places such as the Bay Area. "They could have just done a 100 percent regular apartment project but they believe in this model and helping people of all means," Manthe said. "It's one reason we were attracted to this developer."